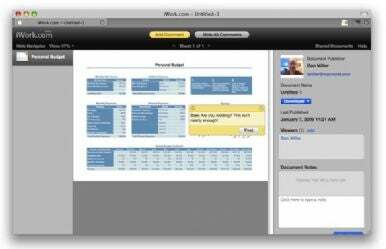 Remember Apple’s iWork.com? The free service, which debuted in beta form at last year’s Macworld Expo, let users share their iWork files for viewing, commentary, and downloading by others. Of course, it didn’t actually let you edit those hosted files and the service as a whole hasn't really caught on. But after a year of little movement on the project, the company released several new features on Tuesday. The features are again designed primarily for sharing and displaying documents—there’s still no option to edit someone else’s files—but it opens up more possibilities. Previously, to share a document, you had to either select a specific e-mail address (or set of addresses) to send them a custom password to access iWork.com. If you wanted to send an “open” document, you had to know to leave the e-mail field blank. Now, you can select Apple’s new “public link” feature to send a document to your entire office or elsewhere (to Twitter, for example) and you no longer need to go through the invitation process. However, if you want someone’s feedback on the piece, you’re going to want to stick with the password option, as people who follow a public link cannot add comments or notes. Apple is also touting support for Safari on the iPad, iPhone, and iPod Touch—which, considering prominent featuring of iWork for the iPad, isn't exactly a shock—and an improved Shared Documents page. To take advantage of some of these features, Apple does recommend you be running the latest version of iWork. And if you decide to try out this newest iteration, don’t forget to tell Apple what you thought. After all, if the company wants feedback, it can’t hurt to drop a hint or two about online document-editing along the way.